Entwined Hat & a new cardigan! I can't believe it's already Saturday. And I can't believe that today is my 28th wedding anniversary. It seems impossible and yet when I look back at all that has happened in the last 28 years it is entirely possible. Does that make sense? We have a fun dinner reservation for tonight and I love our gift to each other this year. It is a state park pass. Simple as that. We are embarking on a challenge together. We are set to take 60 specific hikes in our area and many involve state parks thus the pass is needed. I'm going to tell you more about this adventure later as it is really fun. We have done three hikes so far and we have a long way to go. Anway, I hope you are all doing well! 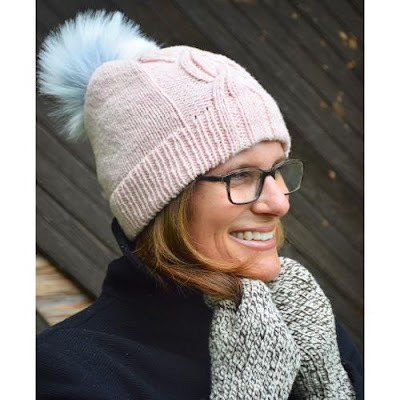 Yesterday I released a new hat pattern. It is called Entwined. See how the cable meanders back and forth? It overlaps in the center and it looks WAY more complicated than it really is, which is always the best thing in knitting. The hat is sized to fit an average adult head, 20-23-inches in circumference. It would also fit a teen. 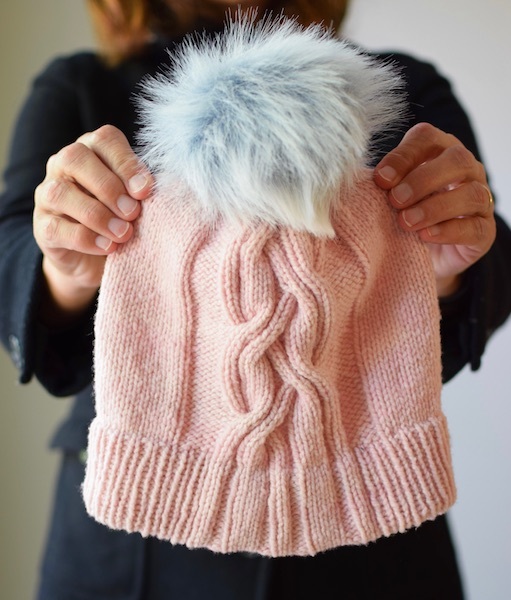 The finished circumference is 19-inches but the hat has incredible stretch so it is kind of a perfect fit. We have beautiful kits for Entwined on Barrett Wool Co. that include the fantastic handmade faux-fur pom-pom. 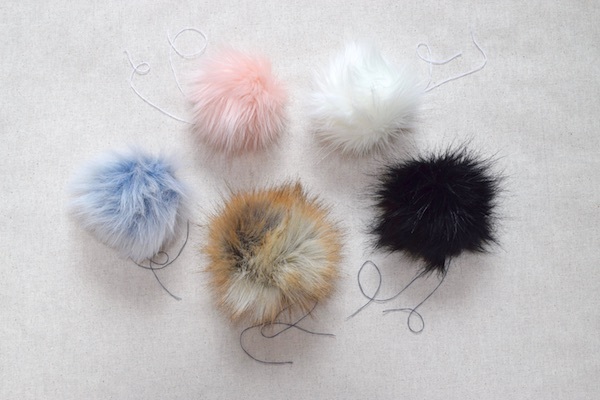 We have five cool color choices for the poms and loads of color choices for the Wisconsin Woolen Spun Worsted yarn. You get to mix-and-match your own kit! Click here to see more about the Entwined Kits! All of the hat details, yarn, size, needles, etc. are here, too. The kit includes a Ravelry download code for the pattern. The Entwined hat individual pattern is available on Ravelry, too. The pattern is set at an introductory discount through Monday, July 3, 2017, for $3.50. No code is needed. On July 4, 2017, the price will be set at $5.00. Enjoy the discount if interested. Click here to see more information or to purchase the Entwined pattern on Ravelry! If you haven't tried the Wisconsin Woolen Spun yarns yet you are really missing out. It is an experience like none other. I can't say enough about this beautiful, squishy and light as air yarn. It is out of this world. Click here to see the Wisconsin Woolen Spun and Home yarn lines! I love the fit of this hat so much. We have those Bulky Mitten Kits available in the shop, too! 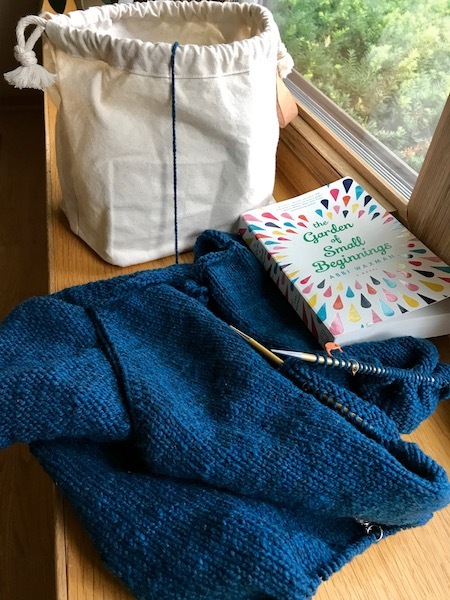 The kit includes a full skein of the Wisconsin Woolen Spun Worsted and handmade faux-fur pom, both in your colors of choice, a tin of stitch markers, a hand-stamped cotton project bag, and the Ravelry download code for the pattern. That way the pattern will be stored right in your Ravelry pattern library. 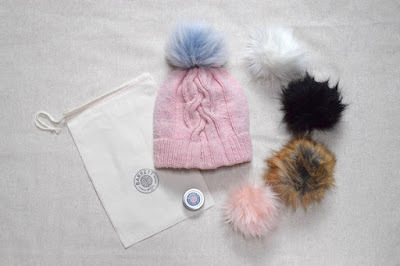 The faux-fur pom-poms are my favorite part of the kits! They are really fantastic. Now onto another quick subject. I am working away on a new cardigan. It is short-sleeved and kind of open in the front. It is knit in Wisconsin Woolen Spun Worsted and I am loving it. It is super simple and we are going to have cardigan kits coming up soon. The pattern is by a guest designer which is super fun. I think you are going to really like this one. The book is really good, too. I am about halfway through. It is called The Garden of Small Beginnings by Abbi Waxman. I recommend it. The kits are flying out of the shop as I am writing this so if you are interested hop on over! Have a super day and I'll be back here soon with more.